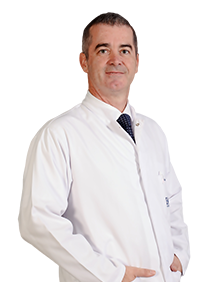 Associate Professor Murat KAYALAR, born in 1968 in Amasya, specializes in orthopedics and traumatology, hand surgery, microsurgery and shoulder surgery. He speaks English. He is married and has two children. Syndactylizing arterialized venous flaps for multiple finger injuries. Kayalar M, Levent K, Sugun TS, Gurbuz Y, Savran A, Kaplan I.Microsurgery. 2014 Apr 30. Traumatic hemipelvectomy: case presentation. Kayalar M, Gürbüz Y, Süğün TS, Kaplan I.Acta Orthop Traumatol Turc. 2014;48(2):226-30. Surgical reconstruction in Wassel type IV thumb duplication. Kayalar M, Gürbüz Y, Küçük L, Sügün TS, Ademoğlu Y, Ozaksar K.Acta Orthop Traumatol Turc. 2014;48(2):181-6. Sonographic assessment of transverse carpal ligament after open surgical release of the carpal tunnel. Karabay N, Kayalar M, Ada S.Acta Orthop Traumatol Turc. 2013;47(2):73-8. Limb salvage and amputation in Type 3C tibial fractures. Sügün TS, Özaksar K, Toros T, Kayalar M, Bal E, Özerkan F.Acta Orthop Traumatol Turc. 2013;47(1):19-26. Peroneal nerve injury surgical treatment results. Gürbüz Y, Sügün TS, Özaksar K, Kayalar M, Toros T, Ademoğlu Y.Acta Orthop Traumatol Turc. 2012;46(6):438-42. Free vascularized fibular grafts in Type 3 open tibia fractures. Özaksar K, Sügün TS, Toros T, Gürbüz Y, Kayalar M, Özerkan F.Acta Orthop Traumatol Turc. 2012;46(6):430-7. Comparison of dorsal and volar percutaneous screw fixation methods in acute Type B scaphoid fractures. Gürbüz Y, Kayalar M, Bal E, Toros T, Küçük L, Sügün TS.Acta Orthop Traumatol Turc. 2012;46(5):339-45. Humeral shaft nonunions: plates and nails Sügün TS, Ozaksar K, Toros T, Kayalar M, Bal E, Ozerkan F.Eklem Hastalik Cerrahisi. 2012;23(3):150-5. The effect of medial side repair in terrible triad injury of the elbow. Toros T, Ozaksar K, Sügün TS, Kayalar M, Bal E, Ada S.Acta Orthop Traumatol Turc. 2012;46(2):96-101. Results of volar locking plating for unstable distal radius fractures.Sügün TS, Gürbüz Y, Ozaksar K, Toros T, Kayalar M, Bal E.Acta Orthop Traumatol Turc. 2012;46(1):22-5. Risk factors for occupational hand injuries: relationship between agency and finger. DavasAksan A, Durusoy R, Bal E, Kayalar M, Ada S, Tanik FA.Am J Ind Med. 2012 May;55(5):465-73. Long-term functional results after radial nerve repair.Gürbüz Y, Kayalar M, Bal E, Süğün TS, Ozaksar K, Ademoğlu Y.Acta Orthop Traumatol Turc. 2011;45(6):387-92. Results of partial matrixectomy for chronic ingrown toenail.Kayalar M, Bal E, Toros T, Ozaksar K, Gürbüz Y, Ademoğlu Y.Foot Ankle Int. 2011 Sep;32(9):888-95. Finger replantations after ring avulsion amputations.Ozaksar K, Toros T, Sügün TS, Kayalar M, Kaplan I, Ada S.J Hand Surg Eur Vol. 2012 May;37(4):329-35. The results of reverse-flow island flaps in pulp reconstruction.Kayalar M, Bal E, Toros T, Ozaksar K, Sügün ST, Ademoğlu Y.Acta Orthop Traumatol Turc. 2011;45(5):304-11. The outcome of direct-flow neurovascular island flaps in pulp defects.Kayalar M, Bal E, Toros T, Süğün ST, Özaksar K, Gürbüz Y.Acta Orthop Traumatol Turc. 2011;45(3):175-84. What kinds of hand injuries are more likely to result in amputation? An analysis of 6549 hand injuries. Durusoy R, Davas A, Kayalar M, Bal E, Aksu F, Ada S.J Hand Surg Eur Vol. 2011 Jun;36(5):383-91. Validity of ultrasonography in surgically treated zone 2 flexor tendon injuries. Sügün TS, Karabay N, Toros T, Ozaksar K, Kayalar M, Bal E.Acta Orthop Traumatol Turc. 2010;44(6):452-7. Epidemiology of injuries treated at a hand and microsurgery hospital.Davas Aksan A, Durusoy R, Ada S, Kayalar M, Aksu F, Bal E.Acta Orthop Traumatol Turc. 2010;44(5):352-60. Screw prominences related to palmar locking plating of distal radius.Sügün TS, Karabay N, Gürbüz Y, Ozaksar K, Toros T, Kayalar M.J Hand Surg Eur Vol. 2011 May;36(4):320-4. Unipedicled laterodigital transposition flap for covering dorsal longitudinal skin defects in multi-digit injuries. Toros T, Özaksar K, Sügün TS, Kayalar M, Bal E, Ademoğlu Y.J Hand Surg Eur Vol. 2011 Mar;36(3):179-84. The results of treatment for isolated zone 3 extensor tendon injuries.Kayalar M, Bal E, Toros T, Süğün T, Keleşoğlu B, Kaplan I.Acta Orthop Traumatol Turc. 2009 Aug-Oct;43(4):309-16. Long-term results of major upper extremity replantations. Sugun TS, Ozaksar K, Ada S, Kul F, Ozerkan F, Kaplan I, Ademohlu Y, Kayalar M, Bal E, Toros T, Bora A.Acta Orthop Traumatol Turc. 2009 May-Jul;43(3):206-13. Evaluation of peripheral nerves of the upper limb with ultrasonography: a comparison of ultrasonographic examination and the intra-operative findings. Toros T, Karabay N, Ozaksar K, Sugun TS, Kayalar M, Bal E.J Bone Joint Surg Br. 2009 Jun;91(6):762-5. The importance of patient selection for the treatment of proximal humerus fractures with percutaneous technique. Kayalar M, Toros T, Bal E, Ozaksar K, Gürbüz Y, Ademoğlu Y.Acta Orthop Traumatol Turc. 2009 Jan-Feb;43(1):35-41. Comparison between two mini incision techniques utilized in carpal tunnel release. Bal E, Pişkin A, Ada S, Ademoğlu Y, Toros T, Kayalar M.Acta Orthop Traumatol Turc. 2008 Aug-Oct;42(4):234-7. Elbow arthrolysis in severely stiff elbows. Kayalar M, Ozerkan F, Bal E, Toros T, Ademoğlu Y, Ada S.Arch Orthop Trauma Surg. 2008 Oct;128(10):1055-63. Isolated severance of the intrinsic motor branch of the ulnar nerve caused by stab injuries to the hand: A report of three cases. Ozaksar K, Toros T, Kayalar M, Ademoğlu Y.Acta Orthop Traumatol Turc. 2007;41(3):249-52. The effect of dorsal cortical comminution on radiographic results of unstable distal radius fractures treated with closed reduction and K-wire fixation.Vatansever A, Pişkin A, Kayalar M, Bal E, Ada S.Acta Orthop Traumatol Turc. 2007;41(3):202-6. The importance of finger extension test in the diagnosis of occult wrist ganglion. Kayalar M, Vatansever A, Bal E, Toros T, Ozaksar K, Ada S.Acta Orthop Traumatol Turc. 2007;41(1):42-7. The frequency of vascular variations and complications with the use of the posterior interosseous artery flap. Bal E, Ademoğlu Y, Kayalar M, Toros T.Acta Orthop Traumatol Turc. 2006;40(4):307-10. Reconstruction of skin and tendon defects from wound complications after Achilles tendon rupture. Ademoğlu Y, Ozerkan F, Ada S, Bora A, Kaplan I, Kayalar M, Kul F.J Foot Ankle Surg. 2001 May-Jun;40(3):158-65.